I did manage to catch up on a lot of my blog reading yesterday, but for those of you I haven't gotten to yet, just bear with me! Today's post is about a preppy wardrobe staple: Rainbow Sandals. Rainbows come in an array of styles, however the most popular is the "Premier Leather" style. They are offered in both a wide and narrow strap for ladies and just a wide for men. I prefer the narrow strap. The neutral color goes with just about any outfit and the soles mold to your feet for a super comfortable fit! I bought my first pair of rainbows junior year of high school, SIX YEARS AGO, and have been wearing them like crazy ever since. These flip flops have been worn in the ocean, in the mud, crazy storms, and more! Because their condition has worsened I've been meaning to get a new pair all summer. Well, yesterday, I popped into J. Crew. Though I didn't find any clothes to buy, I did find that they now sell Rainbows and jumped at the chance to buy a new pair! Hopefully these will hold up for six years too! Do you own a pair of Rainbows? What are your favorite flip flop brands? As a side note, I have some news for you. Last week, while celebrating JLA's 22nd birthday, I met quite the gentleman. We hit it off and are going on a first date tonight. This is the first guy I've been excited about in a while so keep your fingers crossed all goes well! Finally, today is the last day I will be accepting questions for "Ask Allie." If you have any questions, you're dying to ask me put them in your comment or shoot me an email at sundressesandsmiles@gmail.com. Tomorrow's post will feature answers to all of your questions and I'd love to get some more questions from y'all! Nothing is off limits! Eeeeeee, so exciting! A guy! I can't wait to hear about the date! I've always loved Rainbows too and I love that you had the same pair for six years! PS- My friends husband used some sort of rub on his ribs (will try to find out!) and also has a Green Egg that he made them in which I hear makes all the difference! 1st dates are always the best! Let us know how it goes and fingers and toes crossed for you. :) Also, totally agree with you on Rainbow sandals. You should try the hemp style next. And I love Rainbow Sandals! They are the perfect summer flip flop! 1. I had Rainbows for 6 years and wore a whole through the big toe. 2. You look so pretty in that pic. 3. YAY! For a first date. I will probably email you right before I go to bed to find out how it went because I want all the juicy details :) Fact: I'm a hopeless romantic. I'm obsessed with my rainbows and have had the same pair for 10 years. I can't get rid of them! I love rainbows-my last pair was so ruined I had to get another. You look gorgeous in that picture-I really hope your date goes well! Tell us all about it! 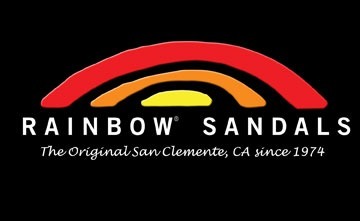 I love my Rainbows! I tried on a pair of Sanuk "kiss and tell" it was like heaven on my feet and the style is super cute. Thanks for the post! Yay for your date! I hope it goes really well!! You will have to let us know how it goes! I love rainbows! I got my first pair in high school, but have lost them along the way. I have about 5 pairs, though. My favorite ones are either the "shiny" leather ones or my billfish ones. I love my rainbows too!! Perfect for almost any occasion! Hope the date went well!! I have the same rainbows as your old pair. There is actually a rainbow store on the same street as my apartment. I have no idea how they stay open all year long!!! I have never tried Rainbow flip flops yet. I will though check them out now. Wishing you luck with your first date! YAY! So excited for your first date. Hope you'll let us know how it goes. Love Rainbows, don't own a pair. I'm not sure why, but I have never bought any. Maybe this is the summer I will own some. so so so excited for your date :)really hope it goes well, and can't wait for the answers! enjoy your date tonight! hope it goes great! my husband and i are a house divided when it comes to sandals, I prefer my rainbows and he prefers his reef. I say rainbows all the way and I just replaced mine after 6 years too, terrific sandals! Have fun on your date! As far as the sandals go I definately prefer Reef. They're not the most girly or comfortable at first, but I can't remember the last time I bought a pair of flipflops without the companies' signature banded weave. No way Rainbows at JCrew?? So funny how they are selling outside brands now! I've had my rainbows for five years but I too think it's time for new ones :( Have fun on your date-- too cute!! Do you know that I have never owned Rainbows? Like a sin at UVA! Have fun on the date! I am so behind on reading. I hope you have a great date. Six years? I'm impressed! I've had mine for one and I'm about to have to buy a new pair! Yay for a first date!!! Can't wait to hear! I also love my rainbows. I have three colors and they're my favorite casual shoe! In the summer I practically live in my rainbows! Wearing in a new pair is always the hardest part!